going back to the start and the progression Eb F G F using a DGBE tuned instrument. Look where the Eb, F and G notes are on the B string. 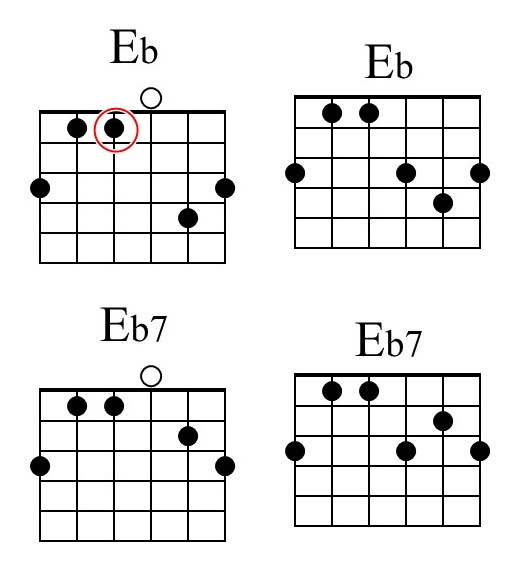 Make a D chord shape (for DGBE) with the Eb note on the B string (fret 4?). Just hold the shape and slide it up to where the F note (fret 5?) and G (fret 7?) note is on the B string. If you can't reach the D string, just play the GBE strings. The progression is a bridge according to the first post so the ascending chords may fit in nicely and you can make the last F 3211 to get back to the first five frets in the verse. The progression is not Eb F G F. It is F G F Eb. Hello. I am playing single note backup to Unchained Melody in key of C. Base note followed by strings 3 2 1 2 3. The Bridge of the song has two lines that are F G F Eb. What can I substitute for this Eb. Something that sounds good and is finger friendly? Thank you. Since the Melody is Unchained, you can substitute whatever melody note your ear feels satisfied with. Sorry I couldn't resist the Unchained comment. But seriously you can always substitute. A lot of my so-called fluency on the ukulele has to do with smoke and mirrors. I almost always opt for what's easy, even when I like those complex swing arrangements with half diminished chords and occasional sharp fives Etc. I go for the easy. And only you can figure out what's easy for you. Sometimes transposing to another key makes a world of ease. Guitar and ukulele keys are not equally easy. There's yer answer. Thank you, Swamp Yankee, as I too have often wished for a pleasant "1st-position-ish" version of the Eb chord (on the guitar), and your suggestion is a nice one. As with many variations on chords, it might not work well in every situation, but it'll work in a lot of them, and it certainly works great in the context of "Unchained Melody". We want to use Eb on the 4th string. Eb7 works for me. Beware the man who only has one gun. He probably knows how to use it! All times are GMT -10. The time now is 02:55 AM.